I had never thought of using a clothes line until we went to France two years ago. And mostly because I had no choice. Our apartment didn't have a dryer (many homes and apartments in France do not), so we had a massive fold-out drying rack that filled up most of our 270 sq. ft apartment. I didn't like drying everything on it, but for the most part, I was surprised at how easy it was. So when we got home, we bought a drying rack from Ikea, and have used it almost every week since we bought it. It isn't great for towels and some stretchy cotton items (baby onesies that have been heavily drooled on, for example), but it is perfect for many, many other items. Your clothes dryer is one of the most inefficient and power sucking appliances in your home. And not really necessary for a lot of your clothes. In fact, many items of clothing can be damaged by heat (shrinking, scorching, etc), so when possible, using a clothes line or drying rack can save you money, and make your clothes last longer. 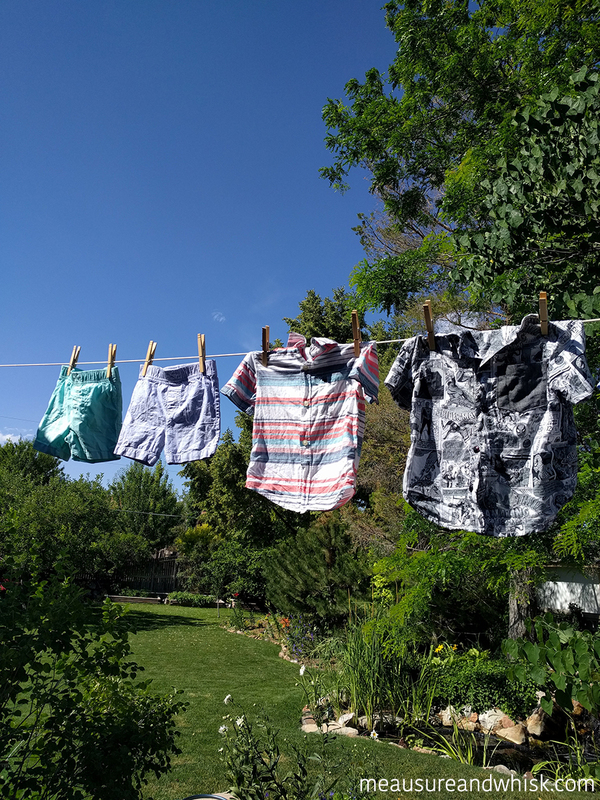 I have been a big fan of our drying rack (and now the clothes line in the back yard), for about half of every load of laundry I do. That may change some once the twins are born, because line drying takes a couple extra minutes, but I love knowing that I am saving myself quite a lot of money every year, and making a great environmental choice. Also, there is nothing quite like sleeping on freshly line-dried sheets. My mother-in-law swears by it, and I now I understand. Just trust me and try it. One final note: if you live in a very humid place, line drying might not be an option for you. When we were in Austin, TX (a relatively humid place), I always dried them inside under the fan, and that worked relatively well, except it made our apartment pretty humid. If you have lots of humidity, you might need to stick with the dryer. If you live in a dry place, hooray for you! Your clothes will probalby dry faster in the summer sun than they would in the clothes dryer. We moved a month ago and have done all of our drying outside on the line since. It has been so nice to know we're saving money and energy and I have been really enjoying it, too! Here in germany it is also very common to dry your cloth on the line. We bought a second-Hand dryer last year and I only use it for towels and undergarment (I love how soft towels are after they were in the dryer since I do not use and fabric softner). You can also dry your clothes outside if it is freezing cold (it has to be a clear day though). It is very similar in England, despite our hideous winter weather we dry outside in summer and then use indoor racks for winter. Most people use the dryer for towels and bedding in winter as it is super hard to get those dry indoors. I guess it is just common for our neighbours to see our undergarments so we don't bat an eyelid. We just moved into a new home a week and a half ago. There is a clothes line in our back yard, and I am thrilled!! My dad used a clothes line my last few years of high school (my parents are divorced so he was just doing it to his clothes), but I remember he made the mistake of not using clothing pins and just draped his clothes over the line, and the sun actually faded his clothes on the parts that were laying directly on the line, so he had sun bleached stripes on his clothes everywhere he went. He marches to the beat of his own drum through, so he wasn't too phased by it. We'll have a really large backyard at our new place in Utah and I'm actually kind of excited to give this a try until the super cold weather hits and then our clothes will just freeze!